The crypto world is expanding faster than the universe itself, and you would surely be interested in catching the trend. In the following lines, we will help you to get familiar with the concepts behind cryptocoins, the blockchain, and ICOs. We hope that this short guide will represent your jump-start into this new realm of amazing possibilities. Want to get Crypto Type gains without having to buy Cryptos Directly? Can I Generate Profits With Cryptocurrency Mining? In layman’s terms, cryptocurrency is a digital currency, i.e., a form of money that is existent in the virtual world alone. We call its unit a coin. The cryptocoins are protected from forgery since they represent encrypted information that cannot be copied. In fact, when referring to cryptocurrencies, we use “crypto-” prefix alluding to cryptography. The main difference between cryptocurrencies and fiat money (regular currencies) is that the latter are issued by central banks and initially have a physical form, at least in theory, while the cryptocurrencies exist exclusively in a digital form and are decentralized. The key technology behind cryptocoins is the blockchain – a decentralized and distributed ledger that holds the whole history of transactions of a cryptocurrency. We’ll uncover it a bit later. There is an open algorithm code involved, which allows everyone with sufficient knowledge and skills to generate new coins. This process is known as “mining.” Yeah – you can play the role of a central bank by issuing new coins. Anonymity – the blockchain system of a cryptocurrency does not include personal information about the parties involved in a transaction. It operates with wallet numbers. Transparency – despite the anonymous nature of transactions, most of the popular cryptocurrencies today are very transparent and verifiable thanks to the same blockchain technology. The security level with cryptocurrencies is very high – cryptocoins cannot be copied in any way. With the increase in the complexity level, it becomes unprofitable for individual users to mine cryptocoins. Today, people often refer to cryptocurrencies in general, as there are many them. However, some years ago it was all about Bitcoin – the first digital money to be implemented in practice. The world could learn about Bitcoin back in 2008 when an entity under pseudonym Satoshi Nakamoto created this new form of money. Till this day, Satoshi Nakamoto remains a mystery. No one knows whether it was an individual or a group of people operating behind this fictive name. Soon, Bitcoin started to gain traction, as more and more merchants and funds accepted it as a payment method. People could easily convert their fiat money to Bitcoin with the emergence of Bitcoin exchanges, such as Coinbase or Mt Gox. The latter was forced to file for bankruptcy because of a hack. Bitcoin’s price showed an impressive yield, growing from a few cents in 2010 to a few dollars in 2011-2012, and then a few dozens in 2013. Anyway, these figures are laughable compared to today’s Bitcoin price at $4,320. Soon, many other cryptocurrency projects made their appearance in parallel. These new cryptocurrencies have had relatively the same principles as Bitcoin, but they were trying to come with improvements related to the speed of transactions and anonymity level among others. Litecoin is the oldest altcoin (altcoin is any cryptocoin other than Bitcoin), being followed by a wide list of cryptocurrencies among which we could distinguish Namecoin, Dogecoin, Ripple, Dash, Monero, and Ethereum. Ethereum, released in 2015, is one of the latest names in the crypto industry, but it has already managed to hit the market with its new concept of smart contracts. Some experts expect it to surpass Bitcoin in the future. With more new cryptocurrencies in the market, and with the appearance of ICOs (Initial Coin Offerings – we’ll explain it below), Bitcoin’s market share dropped from over 90% in 2016 to less than 50% today. As we have already mentioned, blockchain is the system behind most of the cryptocurrencies, starting with Bitcoin and ending with Ubiq – one of the latest names in the crypto industry (it was released in 2017). Do not confuse blockchain with Bitcoin or with blockchain.info service. It is an entirely separate concept that refers to a distributed database. If we step-down into the real world, then we’ll discover that transactions with fiat money keep close to the public eye. Only authorized institutions have access to these – we speak about banks, governments, and similar organizations. Since we all trust our money to banks and intermediaries, we call it a centralized system. Blockchain technology can remove all these intermediaries thanks to its distributed database format. It means that all the transactions are carried out within this system without any third parties involved. The blockchain is a single network of accounting books that is accessible to everyone at any time. It would be impossible to hack it since the same archive of the ledger is located in thousands of servers around the world – anyone can download it. When a new transaction is made, this ledger gets updated on all the servers at the same time. In the case of Bitcoin, blockchain shows who owns it and how many coins. In simple words, blockchain represents a chain of blocks (hence the name). 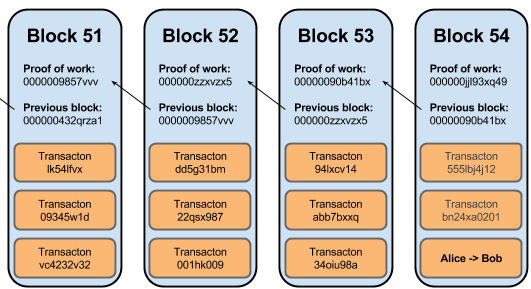 Each block is a new transaction, and it displays relevant info such as the amount of transaction, parties involved, time and date of the transaction, etc. There are sophisticated algorithms and software systems (miners) that monitor the whole ledger. The miners play a significant role since they check and record the blocks, getting a reward paid in Bitcoin. This is how new Bitcoins are generated. The public key (an ID instrument) for the sender and receiver of the transaction. Thus, the fact that each block contains ID numbers of the previous one makes the blockchain have a chronological order. You may be tempted to try Bitcoin mining on your own. Many beginners have heard that a good enough graphics card and a powerful computer can help them generate new Bitcoins. Well, this is not the case today. Some years ago it was achievable since the demand for Bitcoin was not that high. However, as it became popular, the demand has increased, and the miners have developed advanced mining systems called ASICs. In short, mining turned out to be available for institutions and groups rather than single individuals. But don’t get discouraged. Mining is still an option for some older altcoins and every new script-based cryptocurrency at the inception level. Dogecoins, Feathercoins, and Litecoins are the most cost-effective cryptocurrencies for miners. In the case of Litecoins, one can generate from one to ten dollars daily. Anyway, you should not expect big money with mining. In this section, I will refer to Bitcoin, but most of the operations are valid for any cryptocurrency out there. If you plan to invest in Bitcoin, there is no way for you to skip picking a secure Bitcoin wallet, which is a virtual place where you can store your Bitcoin addresses and private keys. Some people think that one gets the wallet to store Bitcoin itself, which is not true, technically speaking. It just hides the private keys and addresses from the public eye. Hardware wallet – this is a hardware device where you can keep your Bitcoin offline. This wallet type is the best choice for those who consider safety a priority. Online wallet – this is a cloud-based wallet provided by a Web-based service. It is clear that you can access the wallet through a browser. Software wallet – this type of wallet is more secure than the previous one. You should download a PC or mobile application to operate with it. Paper wallet – it resembles a credit card, and it has the Bitcoin addresses and keys printed on it. You can build a paper wallet on your own, by applying a service like this: https://www.bitaddress.org/. Internet based wallets are convenient, but you should consider them only for small amounts of Bitcoin since they are more vulnerable than hardware wallets. You should opt for the latter when you want to store large sums. Each Bitcoin wallet has a specific number called Bitcoin address, which is made of 30-34 numbers and letters. A Bitcoin address can look like this: 15vScGvSjJlpNbqROoStoXN7eXydaN2KNN. You should use this long code as payment requisites when you transfer Bitcoin (receive payment). Blockchain info is an Internet wallet service. It has the largest client base, at least according to their figure of 8 million customers. The interface can be accessed from a PC browser or a mobile phone. Coinbase is a reputable brand that combines crypto exchange services with Bitcoin and Ethereum wallet solutions. See our Coinbase review here. Armory is one of the first choices when it comes to software wallets. It boasts one of the most sophisticated desktop wallet apps, yet it’s not for newcomers. Nano Ledger S is a hardware wallet made for Bitcoin buyers who need the greatest security measures. It is a device similar to a USB flash. You have to pay under $60 for it, but it’s worth trying. Ledger wallet can keep your Bitcoin safe offline. Note that you have to connect your wallet to a computer before making any transaction. Coinbase is among the most reputable names when it comes to Bitcoin exchanges. The service, headquartered in San Francisco, California, has been active since 2012. Coinbase is available in 32 countries, including the US. Americans can deposit money with bank wire transfer or credit/debit card (VISA and MasterCard). PayPal is available for the withdrawal of funds. The deposit/withdrawal fees are 1.49% for the US citizens who opt for wire transfer, and 3.99% for credit or debit card transfer, the latter being processed within seconds. For a limited time, get $10 USD of FREE bitcoin when you use this link to get started. We highly recommend that everyone gets started with signing up to Coinbase and then coming to Binance and signing up there as well. All the coins many people want access to are not only available on Coinbase. Binance has stop and limit orders (if you are a trader you will love these features). As of this writing, Binance charges an average fee of 0.1% on each trade that a user makes. If you choose to pay via the Binance token, one can get a 50% discount on the trading fee, which is absolutely great news. Kraken is another San Francisco based exchange, and it has operated since 2011. It is well-liked because of its advanced security features. Its platform allows margin trading with up to 5:1 leverage, which means that you can boost your potential return per investment by five times! However, keep in mind that the leverage adds additional risk. With Kraken, one can trade Bitcoin, Ethereum, Dogecoin, Litecoin, Ripple, Dash, Monero, Stellar/Lumens, ICONOMI, Melon, Tether, Gnosis, and more. As you can see, it has the largest palette of cryptocoins among reputable exchanges. Gemini is a New York based exchange that provides crypto trading solutions for both individual and institutional clients. The company is regulated by the New York State Department of Financial Services (NYSDFS). The exchange deals with three pairs only, which are made of US dollar, Bitcoin, and Ether. One of the distinct advantages with Gemini is the low fees. We recommend you to move your crypto-funds to a secure wallet immediately after dealing with an online crypto exchange! Besides typical Internet-based crypto-exchanges, you can also consider peer-to-peer marketplaces like Localbitcoins and Paxful, where you can buy directly from people in your neighborhood. Bitcoin infrastructure would not be complete without ATMs, also called BTMs or Bitcoin vending machines. Bitcoin ATMs are convenient and fast. The only drawback is their fees, which are generally high. You should be ready for a commission from 4% to 10% and sometimes getting above 20%. Insert your dollar banknotes. You will see the exchange rate. That’s it! Now you can verify your crypto wallet. One of the best services to locate Bitcoin and crypto ATMs on the map is Coin ATM Radar. It shows 989 Bitcoin ATMs on the US territory. The number of ATMs is constantly increasing, which substantially supports the Bitcoin trading operations. Ethereum is the biggest rival of Bitcoin. Some crypto experts even suggest that it will overcome Bitcoin in terms of market share and price. As of today, ETH/USD quotation is more than ten times lower than BTC/USD, but who knows? Ethereum has strong fundamentals and great functions that are not accessible to Bitcoin. The main feature that Ethereum can boast with refers to smart contracts. Ethereum blockchain technology allows parties to code contracts that can be automated and get triggered when specific conditions are met. At the moment of writing, ETH/USD price is $327.37, while the market capitalization of Ethereum is $27,825,606,092. Ripple is an altcoin that connects banks, exchanges, companies, and payment providers, with the help of RippleNet. Most of the crypto-coins apply the concept of decentralization, while Ripple comes with a more traditional approach, combining the idea behind SWIFT transactions with blockchain technology. Jed McCaleb created the system in 2013. At the moment, wire transfers with fiat money via SWIFT system can take a few days and even weeks. Ripple can solve all these issues by offering instant transactions for lower fees with the help of their currency – XRP. At the moment of writing, XRP/USD price is $0.209169, while the market capitalization of the Ripple system is $8,020,343,063. Litecoin is one of the oldest and most stable crypto-currencies out there. It was developed in 2011 by Charles Lee, a former Google employee, with the goal to compete with Bitcoin. Litecoin’s blockchain mining is managed by the Scrypt algorithm (Bitcoin is managed by SHA 256). It was designed with the intention to offer mining opportunities for regular users with decent computers. At the moment of writing, LTC/USD quotation is $66.33, while the market capitalization of Litecoin is $3,505,829,314. Dash was created by Evan Duffield and Kyle Hagan. The altcoin addresses the anonymity issues that Bitcoin lacks. Even if Bitcoin is viewed as a method to trade on the dark web and hide money, it is still quite transparent since its blockchain technology tracks every transaction, which is open for everyone. Dash intends to offer digital money that could be traded anonymously for real. It is far from being perfect, and it uses controversial methods, but it has some unique functions that cannot be ignored. Dash uses special computers, known as Masternodes, to hide transactions. These unique networks collect and conduct more simultaneous transactions, which makes it easier to fade the traces. Darksend is the system behind this network, and it does not involve a publicly available database, as with most of the cryptocoins. At the moment of writing, the price for one DASH unit is $324.62, while the market capitalization is $2,449,908,472. Many cryptocoins want to solve particular issues and bring innovation. However, few of them get the public attention. Zcash and Monero are in the top 20, and they both want to solve the anonymity issues, the same as Dash. Though, the two differ from each other in terms of technical features and approaches. Factom is another exciting project. It helps companies create immutable databases. Its price rose from $3 in January 2017, to $25.95 in September of the same year, after hitting $30 in mid-June. Are you curious to know where do all these new cryptocoins come from? Well, in most of the cases, an ICO is organized for each cryptocurrency release. ICO derives from “Initial Coin Offering,” alluding to Initial Public Offering (IPO) in the stock market. The same way as companies raise capital with the help of IPOs, groups of people and institutions can raise crypto funds with ICOs. You can think about an ICO as a method between fund raising or crowdfunding. When an entity wants to start a blockchain-based project, it will organize an ICO during which it would issue new tokens (the future cryptocurrencies) in exchange for BTC or ETH. People would buy these new coins hoping for an increase in their price once the project becomes successful. This phenomenon of ICO evolution is impressive. Many countries were surprised about their influence, which is why they call for more regulation. It is not a general rule, but some tokens have generated astronomical returns. Think about return figures of 1,000%, 10,000%, and even 60,000%. Anyway, investing in ICOs is still a risky move. At the moment of writing, there were raised more than $1.5 billion through ICOs year-to-date, and now it’s only September. To understand the dynamics of growth, think about the fact that in two years from 2014 to 2016, there were raised $294 million through ICOs. The blockchain technology is regarded as a technological revolution comparable to the Internet itself, and this is for good reasons – it can transform the way we make transactions, operate with personal data, negotiate contracts, and do business. Some experts warn us that we might found ourselves in the middle of a crypto bubble, very similar to the dot com bubble in 1999. However, other experts have completely different opinions. For example, Kay Van-Petersen, a Bitcoin analyst, predicted in a CNBC interview that Bitcoin price can reach $100,000 in ten years from now. He expects that cryptocurrencies (not only Bitcoin) will account for 10% of the daily turnover in the Forex market (which is dominated by fiat currencies). Today, this figure is at $5 trillion, and a 10% share for the cryptocurrencies would mean $500 billion – an impressive volume. Today, the daily trading volume of all the cryptocurrencies is over $7 billion. We don’t know the future of Bitcoin and the crypto world, but we are sure that you should not miss the great opportunities that it offers today! Next post: Palm Beach Confidential Review – Is the Newsletter Any Good? Previous post: The Road To Ruin Book Review – Is James Rickards Book The Real Deal?